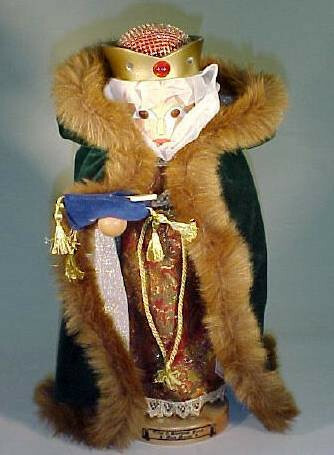 Introduced as the fifth and last of the Sherwood Forest limited edition series in 1998, Maid Marion is perhaps Steinbach's best woman nutcracker. Introduced as the fifth and last of the Sherwood Forest limited edition series in 1998, Maid Marion is perhaps Steinbach's best woman nutcracker. Covering her long hair to conceal her identity, Marion wraps a sheer cloak around her head. She dresses as a page so that she will not be recognized. As the legend goes, her own Robin Hood did not even realize her true identity. The arrow she holds in her right hand represents the prize for the best marksman at the fair. Each is numbered out of 7,500.